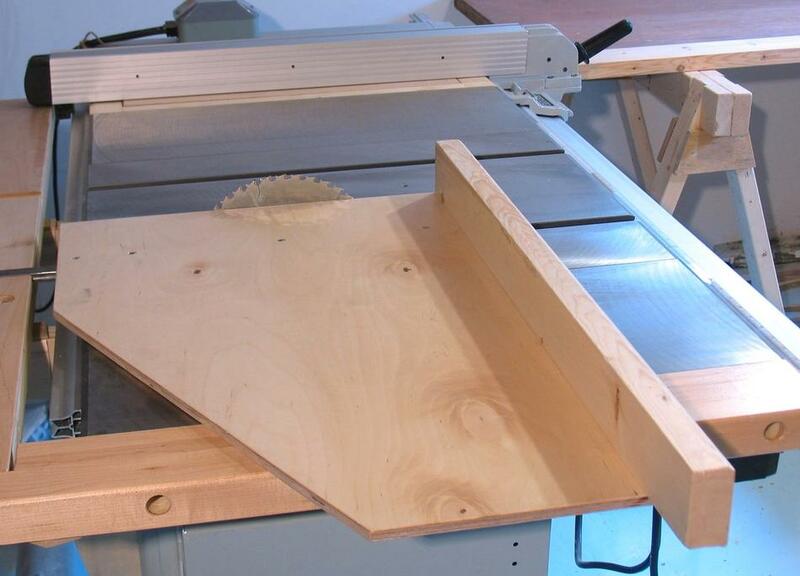 I'm almost always using a table saw sled for crosscuts. 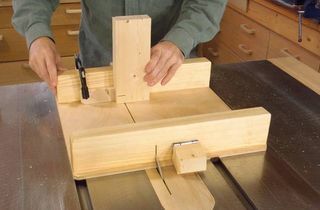 The type of sled that I use on my table saw is not so much a dainty thing that slides on both sides of the grove. Rather, it's meant for crosscutting larger pieces of lumber. Sort of a very sturdy alternative to the miter gauge for crosscuts, closer to a sliding table than a miter gauge. 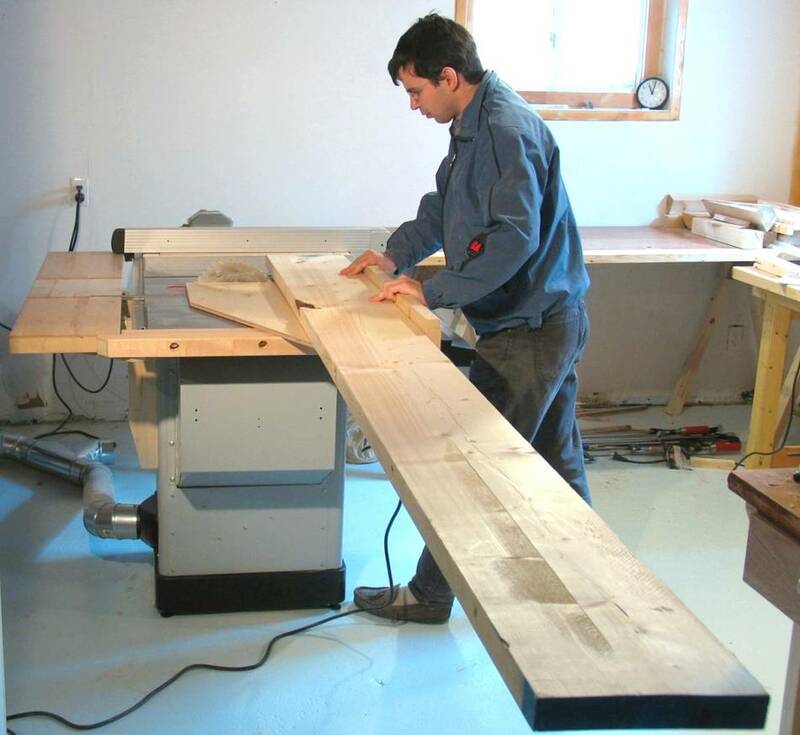 With a sled like this, there's really no need for a dedicated crosscut saw like a miter saw. The sled consists of 10 mm thick Russian birch plywood for a base, and a piece of 2x4 lumber for the fence. 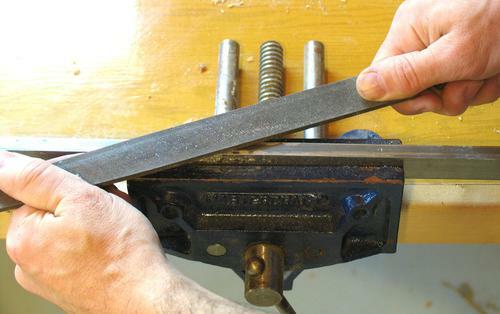 The bar to slide in the T-slot is a cold rolled piece of steel bought from the Metal Supermarket. Making this part out of steel is very important, as it gives the sled its strength and precision. Dimensions are in centimeters, except where indicated as inches. Cold rolled steel is actually quite consistent in width, but the widest piece I could find at the metal supermarket was .006" less than 3/4" of an inch. 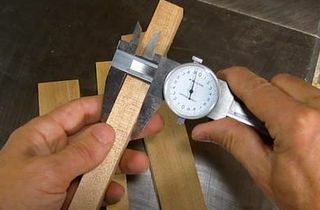 That's still better than my miter gauge, which is .009" under 3/4", but it still leaves a bit more play than I'd like. So I widened the bar just a little bit by striking it with some hammers as shown at left. 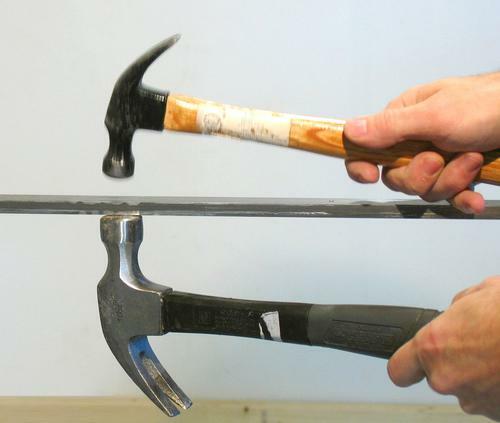 The bottom hammer is held against the piece to absorb the blow, while the top hammer is used to strike. This approach also gives the bar a tiny bit of bend if done more to one side. I found my bar had a very slight bend to it initially, so this method allowed me to straighten it too. After widening the bar, I found I struck too close to the edge a few times, and needed to use a file to remove the bumps. I got it to the point where there is almost no play in the T-slot, yet it slides fairly easily. It took a few tries to get this right! The next step is to attach the bar to the plywood base. 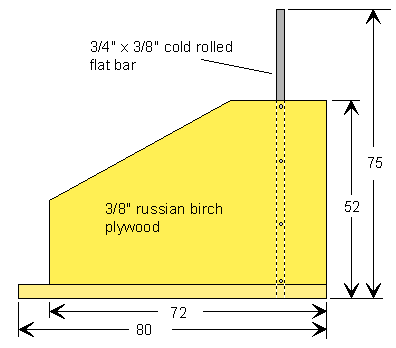 Note the large number of plys in the Russian birch plywood that I used. I placed a screw on the arrangement to illustrate how it goes together. 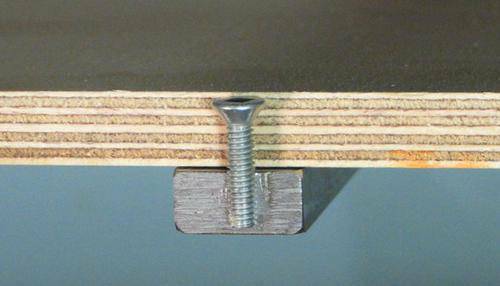 I used #8-32 3/4" long countersink machine screws. I probably drilled the holes a little smaller than I should have, but I wanted to make sure my drill was smaller than the minor diameter of the thread tap, just to make sure I'd have maximal thread engagement. I had to back the tap all the way out about four times for each hole just to clear out the metal shavings. I cut a rabbet joint into the fence on the back of the sled. The fence is about 3" high from the bottom at the back. Note the grain pattern in the wood I used. It's cut out from a 2x8, and I picked a piece with a tight grain pattern that is perpendicular to the piece of wood. This should minimize any warping that might occur with changes in humidity. 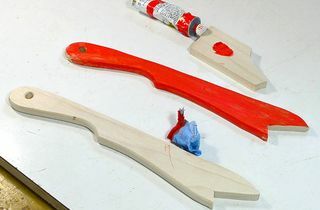 When putting the sled together, I attach the bar to the plywood so that the last millimeter of the plywood hits the blade. Once attached, I just cut the sled off on the saw. The next step is attaching the fence at a right angle. 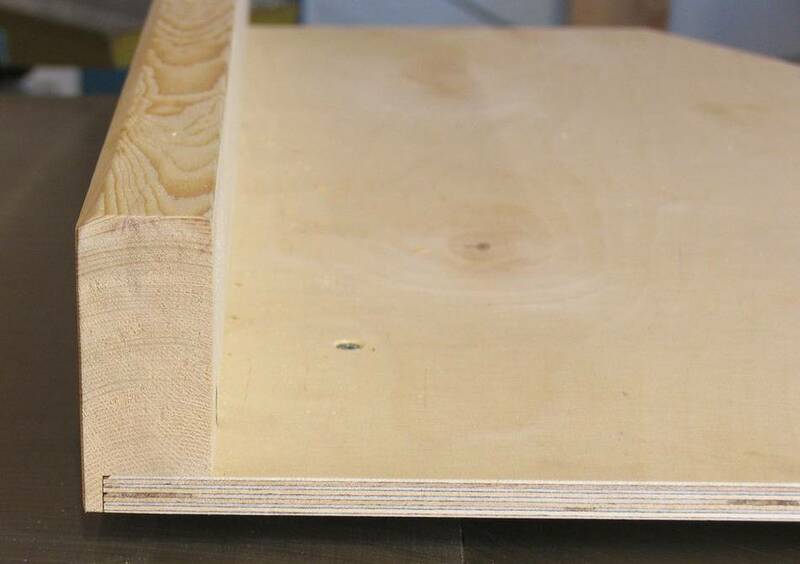 A large framing square, with the just cut edge of the plywood as a reference is best. 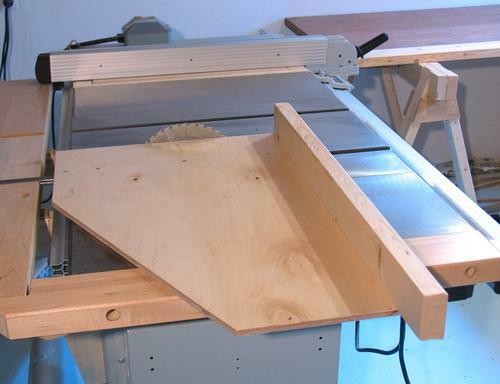 And here's the sled on the table saw. 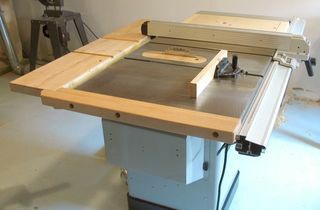 My old contractor saw had 24" of table wing on either side of the blade, more than my new table saw had. I didn't want my new saw to be inferior to my old one in any way, so I extended the table on the left. I varnished the sled and table extensions with Varathane water based floor varnish. This stuff is more expensive than the regular varnish, but it's very hard, and glides very nicely, both of which are desirable attributes for this application. And here's the sled being put to use. This is an 8' long piece of 2x10 lumber. I do need to hold that down fairly well to keep it from pivoting on the edge of the extended table. But it's manageable. 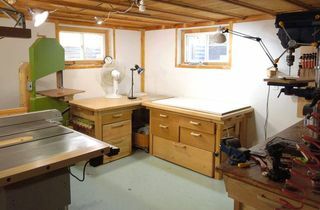 Really, the size of my workshop is a bigger limitation to how long a piece I can crosscut. I can also crosscut plywood with the sled up to about 36" wide. 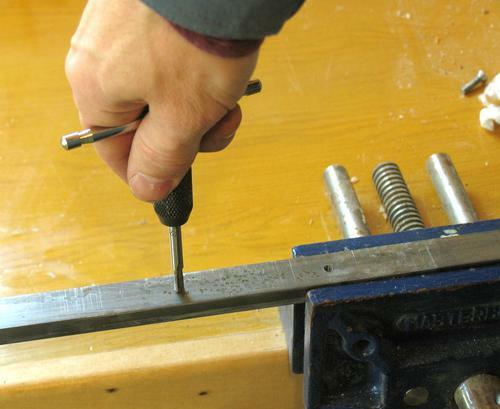 This involves sliding the sled all the way back, so only 6" of the steel bar is still in the T-slot when the cut starts. Not elegant, but manageable.